Telegraph Avenue is one of Oakland's busiest streets, and in Temescal, it shows. 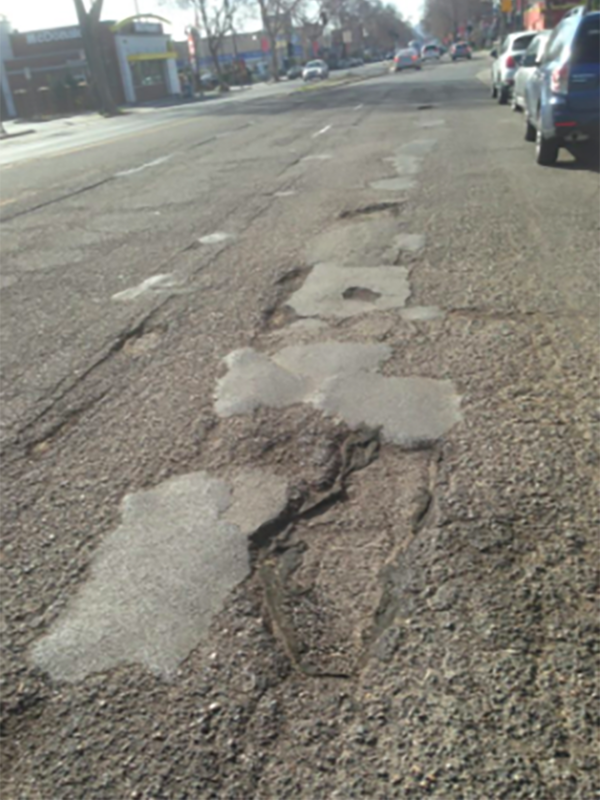 For residents, potholes, buckled asphalt, and poorly marked crosswalks are as familiar as the small businesses that line the corridor between 40th and 51st streets. "Anybody that's driven that section of Telegraph knows that it's deplorable. It's just not user friendly," said area resident Tom Murphy. "For cars, it's annoying. For bikers, it's unsafe," said David Way, owner of Tip Top Bike Shop, located at 4800 Telegraph. "It's like you're riding on cobblestone." Way navigates this stretch of road daily as he bike commutes from his home downtown. He and other cyclists must swerve to avoid rough patches and potholes, putting them in the flow of auto traffic. "You have to navigate the best path," he said. Way moved to Oakland several years ago from the East Coast, where winter road salt and freeze-thaw cycles can stress roadways. "But here I'm just like, what the hell, why isn't this fixed?' They can work year-round here." As a small business owner in a neighborhood which brands itself as small business-friendly, Way wants the city to do more than just patch potholes. "If it were repaved and they put in bike lanes, it would be really great for business here." OakDoT assumed oversight for the City of Oakland's Repaving Program in the summer of 2017. The department maintains a map of paving priorities as well as a city list. Both include a rating system, evaluating streets from zero to 100, with zero representing an unpaved zone and 100 fresh pavement. All ratings below 30 are considered 'failing'. The blocks along Telegraph between 46th and 51st streets had received a rating of just 18. "We've been working with the city to try to get Telegraph repaved for the last ten years," said Shifra De Benedictis-Kessner, executive director of the Temescal Telegraph Business Improvement District (TTBID). The TTBID had been told in 2017 that they were on the short list for resurfacing in 2018. But after making inquiries in January about when repaving would begin, De Benedictis-Kessner discovered that the Department of Transportation had removed that section of Telegraph from the repaving list. "We've been waiting our turn and then to find out that we weren't even on the list anymore was really frustrating," she said. "As the business improvement district, our role is to make sure we're giving businesses the services they need from the city." 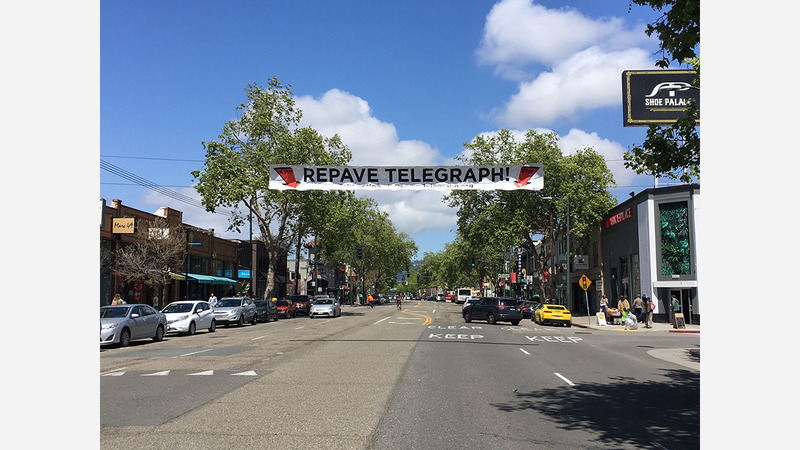 On March 19th the TTBID raised a banner across Telegraph at the intersection with 49th Street with a message for the city and all passersby: "REPAVE TELEGRAPH!" the banner reads, and below, the sign lists a website where curious viewers can take action. The TTBID also began a MoveOn.org petition where residents and visitors can likewise voice their concern. The move got attention at the both the city and neighborhood level.Since the banner was hoisted over Telegraph in March, OakDOT has identified at least one contributor to the decade of delays. "We believe that this was some form of clerical error with the street list," OakDOT wrote yesterday in an email to Hoodline. While city maps showed Telegraph between 46th and 51st streets as having a failing grade of 18 out of 100, the city repaving list only included information for the section of Telegraph from 52nd to Aileen street, which received a rating of 96. OakDOT had been prioritizing repaving projects based solely off the list. The letter continues that the city and OakDOT have corrected the error and "intend to pave Telegraph Avenue between 51st Street and 46th Street in Spring of 2019." Starting next month, OakDOT intends to work with neighborhood businesses, residents and the TTBID on a six-month process to identify potential redesigns for Telegraph in Temescal. "This is not a controversial issue," said De Benedictis-Kessner. "Everybody wants it repaved." The letter from OakDOT includes a link where curious Oaklanders can register for updates.